The vampire Planeswalker Sorin Markov has come to Tarkir seeking the spirit dragon Ugin. 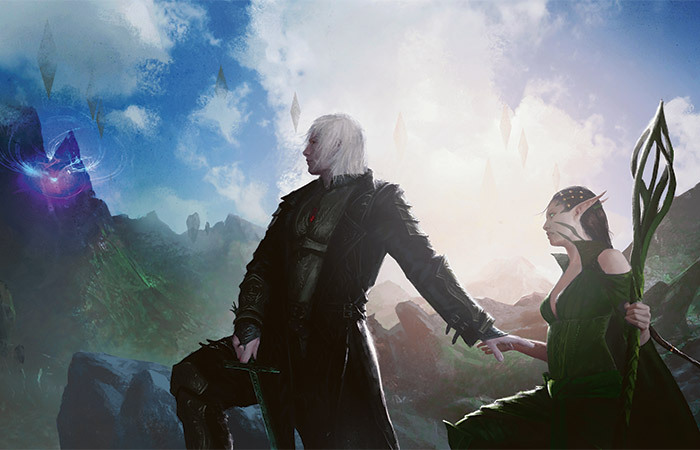 Long ago, Sorin helped Ugin and another Planeswalker, the lithomancer Nahiri, seal away the monstrous Eldrazi on Zendikar. Recently, the Eldrazi escaped, and Sorin believes that Ugin is one of the few who can stop them. Sorin has found his way here, to Ugin's home world, in search of his old ally. In another timeline, Sorin found Ugin long dead, leaving his quest on Tarkir a failure—but Sorin will never know that version of events. 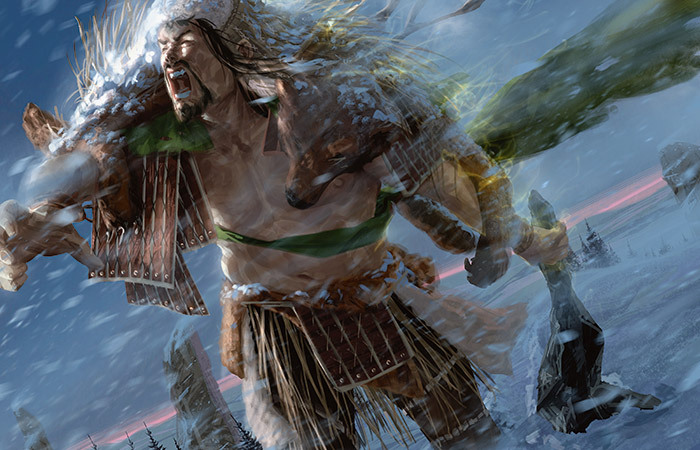 Tarkir's history has been changed, and Sorin's path has a chance to go another way. He holds out hope to find Ugin, but even now, he knows that he may be much too late. Sorin winced at the sun's grotesque glare as if someone had stabbed him. A merciful shadow swept across him as a four-winged dragon sailed over the dry steppe, its outline rimmed in gold sunlight. But then the heat of the steppe closed in on him again. He pulled a hood up over his head. This world was nothing like his chilly Innistrad, but there was a task at hand. He needed to find someone—someone who was very possibly dead. He had never come here before. In all the time he had known Ugin, he had never visited the spirit dragon's home world, nor even asked after it. His only guide now was a cluster of vague impressions given to him by an oracle. This place, with its arid winds and flights of wild dragons filling the skies, was a mystery to him. A company of dragons crackled and swooped in the air above him, which gave Sorin an itch of foreboding about his visit. 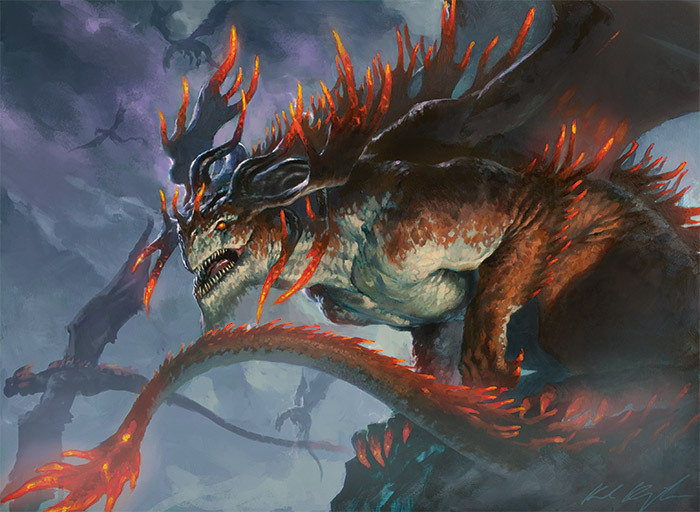 If Ugin was alive, the spirit dragon must have learned of the world-devourers' escape by now. In that case, why hadn't Ugin tried to contact him? Why was he the one coming to Ugin? The Eldrazi were truly free of their imprisonment this time, and there was no way to know what the titans' hunger would wreak—and yet Sorin was the only one doing anything about it. Ugin had been silent for centuries. Sorin may have traveled all this way to find a tomb rather than an ally. Distant, snow-capped peaks stretched along the northern horizon. A single peak stood out, shaped like a twisting dragon's head. The rock formation had a unique structure, identical to the vision Sorin's oracle had conjured. As dragons cawed above him, he walked. The trek toward the spiraling rock led Sorin into cooler air. After a number of days, the land under his boots became ice and snow. An old animal trail led him deep into the mountain wilderness, and the shaggy dragons above breathed gouts of green-tinged fire rather than thunderbolts. Granite peaks, capped in snow and ice, rose up far above Sorin's head as he traversed the crags and passes. He lost eye contact with the spiraling rock for an entire day, and he longed for a sense of certainty that he wasn't wasting his time. 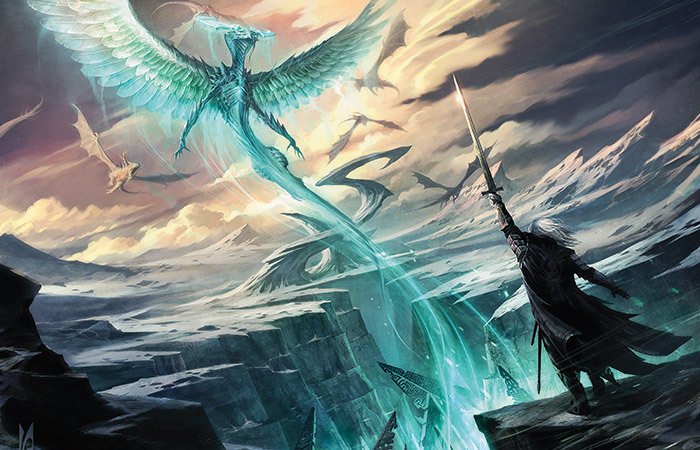 The mad scatter of images from the dark oracle still burned in his mind's eye, and they spelled out a kind of story: a great battle of dragons, a chasm of ice, Ugin's swirling form. But the images were vague, blurred, and chaotic. He needed a guide. Thankfully, the world provided a fine selection of them. "That's far enough, Silumgar death-spawn," said a burly human warrior from atop some kind of long-tusked war-beast. A party of warriors encircled Sorin, wielding spears and sharpened bone-clubs. They wore the layered hides of tundra mammals, and their headdress antlers resembled those of the big firebreathers that hunted in the sky. One of the humans readied a spell, his hand glowing hot like a claw made of fire. The lead warrior spoke again. "Your head will decorate a spear tonight." Sorin and his enthralled guide trekked along the narrow trails and icy crags in relative silence. The thrall floated heavily, his bootless feet dragging across the top of the snow, occasionally snagging twigs or roots from the path. Sorin had fed on the thrall's blood more than once, but now he instead pumped the floating warrior for information. "How long have you known about the domain of the spirit dragon?" Sorin asked. "Our people found the spirit dragon's domain over a thousand years ago. Not long before the Khanfall." "Khanfall?" Sorin asked. "The fall of the khan?" "Khans," said the thrall. "The human clan leaders of old. 'Khan' is a cursed word now. A dead word." "I serve you now, of course, master. But the dragon broods rule the five clans, and those lesser beings—humans, and others of their ilk—serve them." The trail crested a ridge, and the thrall hovered over the top and continued down into a valley where ice had given way to patches of bare earth. "There were once other clans, ruled by arrogant humans. Those clans bore different names, and their warriors killed dragons even of their own land. Traitors. Traitors to the spirit of dragonkind. They earned their fate." "I find it strange whenever mortals seek out their own demise." "They did not possess the spirit of savagery of the great Atarka. They did not survive." The thrall nodded. "Dragonlord of my clan." Sorin asked, "And this spirit of Atarka—you believe that came from Ugin?" "Ugin is the beating heart of the world. He dwells within the Haven. He is why the dragons have their many strengths." So he may be alive after all, thought Sorin. A thought crawled up into Sorin's mind like a spider ascending a thread. He frowned, at a loss for what to do about the skulking thought: the knot of complications involving a certain Zendikari kor woman—Nahiri, the third member of their alliance all those millennia ago. If Sorin managed to find Ugin alive, wouldn't the dragon's first question be about her? Far below was a flat plain of ancient, shattered rock blotched with ice and snow. Sorin could see that the rock on the plain had been warped and shaped by an immense outpouring of energy. A spiral of stone looked as if it had once been molten and made to follow lines of force, then flash-frozen. The strange rock surrounded a deep canyon of blackened granite that streaked through the center of the plain. "There lies the spirit dragon." The Atarka-clan guide pointed to the canyon floor. Dozens, perhaps hundreds, of stone hedrons were piled at the bottom of the chasm. They did not float free, but interlocked with each other, forming a protective sheath. Sorin's hand went to the hilt of his sword. Lithomancy on Tarkir? Had Nahiri traveled here before him and bested the dragon? The oracle's visions had not warned him of any of this. "This is the haven," said the thrall. "The great cradle where the spirit dragon rests." Even from the lip of the chasm, Sorin could see that the stone shapes were old. Ice and debris had settled in the crannies of the magically carved runes, and the elements had worn and battered the stones. These stones had lain here for a long time. Sorin could feel the life essence of the being within the cocoon of hedrons. He wondered if he still knew some of the old blood magic he had used back on Zendikar. "I need to wake the beating heart of your world, thrall," said Sorin. "Have you any more blood in you?" "I fear my veins are brittle, master, and empty of life," said the Atarka guide. "It has been…a long journey for me. But all I still have is yours." Sorin made a dismissive gesture. The thrall collapsed onto the snow, his desiccated body leathery and spent. I'll have to do this with what I have, thought Sorin. Time to awaken, dragon. Sorin unsheathed his sword and pointed it down at the dragon's resting-place. He willed the blood in his body to flow through him, warming him, focusing and concentrating his mana. He pronounced ancient syllables, words worn by time, words of binding and of release. His magic wove around the cocoon and through it, tracing its surfaces, finding the edges of the mystical lock that bound the hedrons together. As blood thudded in his temples, Sorin found the keystone to the cocoon. 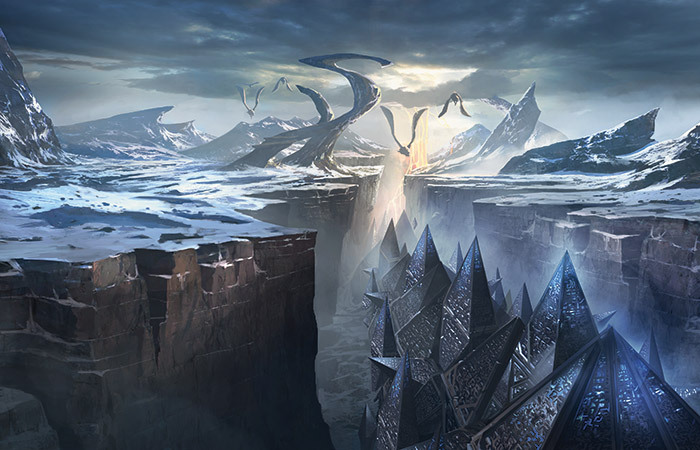 Buried deep within the stone structure was a single, tiny, broken shard—a remnant of Ugin's own magic from another world. That shard was the source of the binding magic. Sorin thrust his sword into the air and shouted an ancient word of unmaking. The hedron shard crumbled to dust, and the cocoon began to crack. Stone surfaces broke and slid, and the structure fell in on itself. 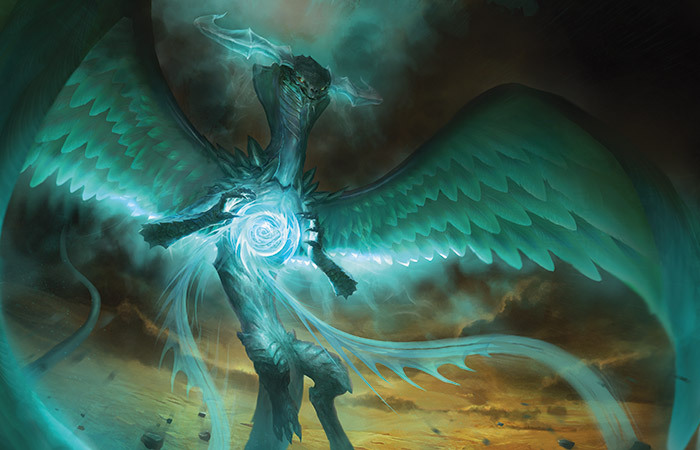 Ugin exploded from the hedron cocoon, rocketing into the air. 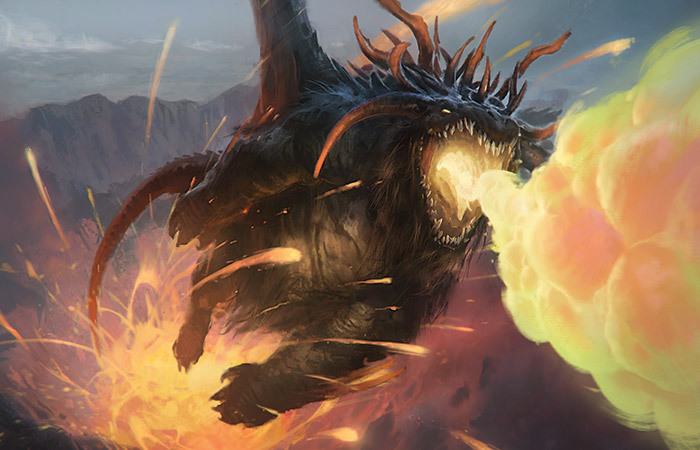 The whoosh of air blew Sorin's hair back as Ugin shot upward in a flurry of wings. Soon, Ugin was only a bright speck against the sky, trailing spirals of shimmering mist through the air, tracing a jubilant path. The air crackled around him. Sorin noted that the clouds seemed to roll and curl in concert with Ugin's flight, as if the dragon obeyed the clouds' laws—or the clouds obeyed his. Sorin sheathed his sword, watching the dragon bank with a billow of his wings. Ugin finally seemed to realize that a force had set him free, and became aware of Sorin back at the lip of the chasm. 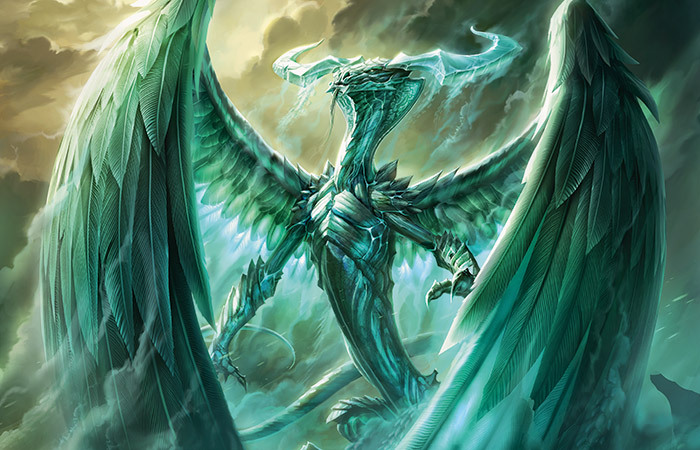 Ugin returned, hovering in the air above the broken ruins of the hedron cocoon. The dragon's voice rumbled. "Sorin?" "Indeed," Sorin said. "What happened here? You were trapped?" A faraway look came over the dragon's face. Ugin blew a gust of mist from his nostrils in a moment of contemplation. "Saved, I believe," said Ugin. He turned his head toward Sorin. There was a strange twist to his neck—it was bent, almost cowed. "Tell me—is Bolas—gone from here?" Sorin didn't know what to make of the question. A battle between dragons had been part of the oracle's visions—perhaps it was the ancient Planeswalker Nicol Bolas that Ugin had faced. Not Nahiri, then. "Did he do this to you?" "He thought me his rival for power, and attacked me. Used my own dragons against me. But someone intervened on my behalf." The dragon examined the hedron ruins below him, and inspected the landscape again. Dragons wheeled in the sky, spitting bright flashes of fire. "It seems I took some time to recuperate. How long?" "Over a thousand years, if the locals are to be believed." Sorin took a note of pleasure in dispensing knowledge to the aeons-old dragon. "I had almost forgotten the look of your face." "Much must have changed." Ugin drew a breath into his chest, then shimmering steam floated from his nostrils into the air above Sorin's head. "Why have you come? Why revive me now?" "The Eldrazi. You're not the only one to have awoken from a hedron slumber." "They can't be—free. The network was built to last indefinitely." "They're free." Sorin had the urge to press the matter, to needle Ugin, to make someone else shoulder the blame. "They awoke, and you didn't come. I suppose you were here at home. Resting in your cradle." Sorin looked at the horizon. "Planeswalkers. And a series of childish errors at the Eye." 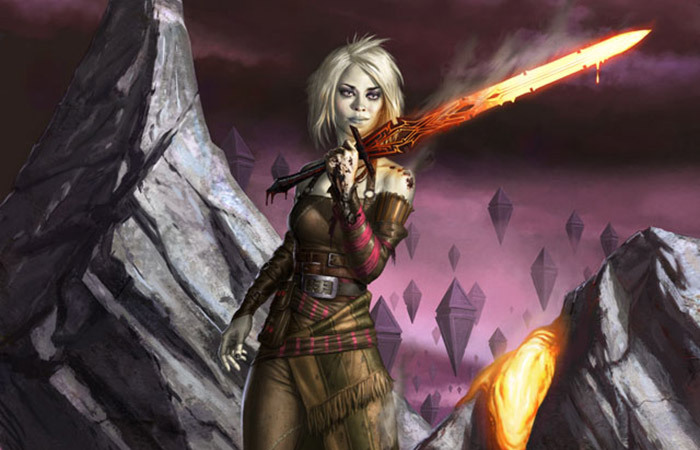 Sorin had traveled to Zendikar to meet the young elf Planeswalker Nissa, a native of the world of Zendikar. He and Nissa had struggled over whether to free the Eldrazi. Nissa chose to release them, thinking it would spare her world—and it hadn't. "What would have led Planeswalkers to do this?" Ugin seemed to be asking himself more than Sorin. Sorin had been there personally, when the Eldrazi rose from their torpor and began their rampage across Zendikar. He had tried to intervene, but the Eye of Ugin had been tampered with. He did not know why their hedron prison had been compromised in the first place—he only knew that Ugin would be crucial to stopping them once again. "I can only tell you what I know." Ugin breathed a different kind of breath. A sigh. "This is frantic news." Sorin saw Ugin's eyes wander to the ground, searching for his next thought. Sorin could see the next question forming—the logical next leap for Ugin's mind to take. He knew that next question would cut deeper. Sorin unconsciously counted the moments. Ugin's eyes swiveled back to Sorin. "Where is the hedron mage? Where is Nahiri?" The notion of shame had long since evaporated from Sorin. Over the millennia, Sorin's human frailties and neurosis had grown, blossomed, and withered away—he was as immune to regret as he was to old age. And yet, for the first time in years, an uncomfortable feeling grew within him, an unpleasant itch, the sense that he was responsible—solely—for something important going awry. It wasn't remorse exactly, just a dull, discordant echo ringing in the space where remorse had once resided. "She is—not here," said Sorin, to no particular patch of air. "That is clear," said Ugin. "I inquired about her whereabouts. Is she still on Zendikar? We should rejoin her, as soon as I am able to travel." "I do not believe that she is there," Sorin said carefully. Ugin's neck pleats fanned in irritation. "Speak facts, you vague thing. She's dead?" "No," said Sorin. "She lives." The fuller extent of the truth was not something Ugin needed to know at this time, in Sorin's estimation. "I think I may know where she might be." "Then fetch her to Zendikar. If the titans remain there, we'll need her to rebuild the hedron network." "Is it crucial that she come?" "Of course it's crucial," Ugin said. "Your blood magic is great, as is my knowledge of the dwellers of void. But none of our efforts can be made permanent without the lithomancer." Ugin curved his body, bringing his head down close to Sorin's, like a bird regarding a worm with its great eye. "Let me be clear. It must be the three of us. Whatever petty tiff you've had with her, or whatever matter it is you're hiding from me, resolve it. I do not wish to see your face without hers." Sorin snapped his head away with his teeth clenched, suddenly gripped by an urge to destroy something. He clasped his own arms, holding his own body in check. He nodded with what looked like bored nonchalance. Ugin gave a single firm nod. "I will join you at the Eye soon. Thank you for your assistance here." Sorin ran his tongue over his fangs, staring a hole in the snowy ground. As he began his planeswalk away from Tarkir, he scanned the shapes above the horizon—not for the birdlike formations of dragons, but to watch Tarkir's rippling stacks of clouds. 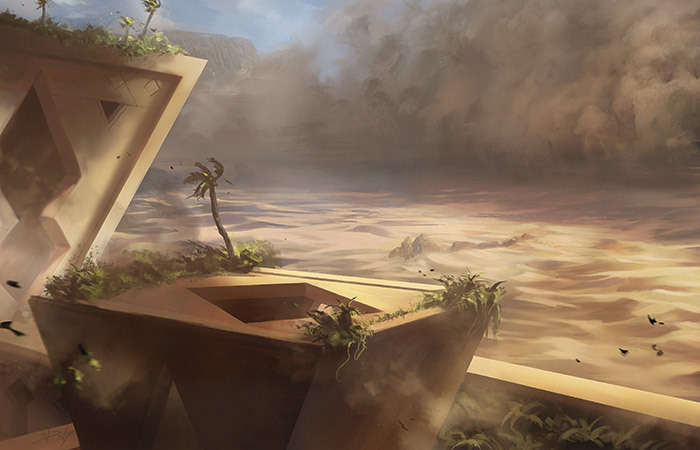 They drifted through the air like the lazily floating islands of the savage world of Zendikar. Things had been so much simpler when he only had his own world to worry about.